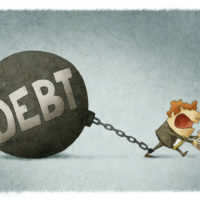 What Happens to Debts after You Pass? As you think through how you wish your estate to be distributed upon your death, you may have a plan for which of your relatives and loved ones should inherit your home or other most treasured possessions. One often-overlooked aspect of estate planning is the debt of the person who dies. Do you know how debts from credit cards, medical bills, or loans will be handled after you pass, and how they will affect the gifts you leave to your heirs? Read on to learn more, and speak with a knowledgeable estate planning attorney for more information. When you pass, any unsecured debts in your name will be paid out of your estate funds and will not become the obligation of your heirs. Unsecured debts include medical bills, credit card debt, or other personal loans for which you didn’t use any property as collateral when obtaining the credit. That said, if a family member cosigned on a loan or other debt, or the creditor can show that a family member jointly assumed a debt, that family member will become responsible for the debt after you pass. If you own a home that has an accompanying mortgage or home equity loan, the result will vary. If your surviving spouse is also listed on the mortgage, then that spouse will assume the mortgage. If you leave your home to an heir, whether your heir can assume the mortgage will depend on the terms of your loan. In some cases, the bank has the right to accelerate payment of the debt, making the balance of the loan due immediately. In most cases, this means that your heir will need to sell the home to satisfy the debt. In other cases, your heir may be permitted to continue making payments on the loan under the same terms as you would have. An estate planning lawyer can help you determine what will happen to your home based on your mortgage terms. Instead of passing to family members, debts are typically paid out of any assets held by the estate prior to distribution of the estate funds to your heirs. However, placing your assets in certain types of trusts can protect them from the reach of creditors. Additionally, creditors may not have the right to collect from certain types of assets, such as life insurance proceeds and retirement plans. Your West Palm Beach estate planning lawyer can help you structure your estate in a way that leaves the maximum amount to your loved ones. For assistance in creating your Florida estate plan, contact the dedicated and detail-oriented West Palm Beach estate planning lawyers at Shalloway & Shalloway for a consultation, at 561-686-6200.